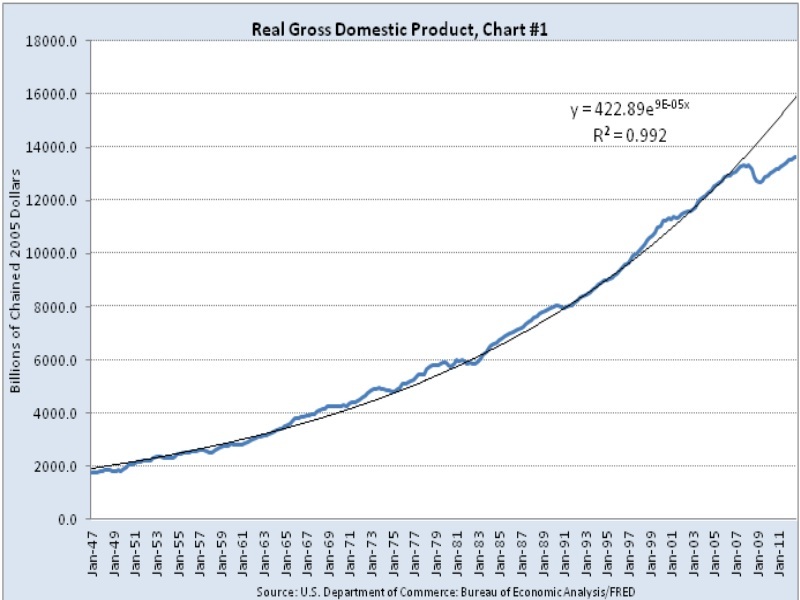 The two charts shown below show “Real Domestic Gross Product” on a quarterly basis. The first chart is January 1947 through October 2012 while the second is from January 1990 through October 2012. All data has been obtained from the St. Louis Federal Reserve “FRED” data base. What is most disturbing is that beginning in fourth quarter 2007 GDP began to diverge from the historical, exponential trendline and has not reverted to the mean since. That is, Chart #1 (1947-2012) shows many quarters of GDP growth below the trendline and many above. That means GDP “reverts” to the mean (in this case the exponential trendline) when it gets too far above or below. Of course it is also a function of the trendline itself being fitted to the data after the fact. As the “R2” figure indicates the trendline “explains” some 99% of the data. For the last 5 years to diverge as significantly suggests the US economy has in fact entered a new stage. And not a welcome one at that. The divergence from historical trend is even more pronounced when viewed in Chart #2. 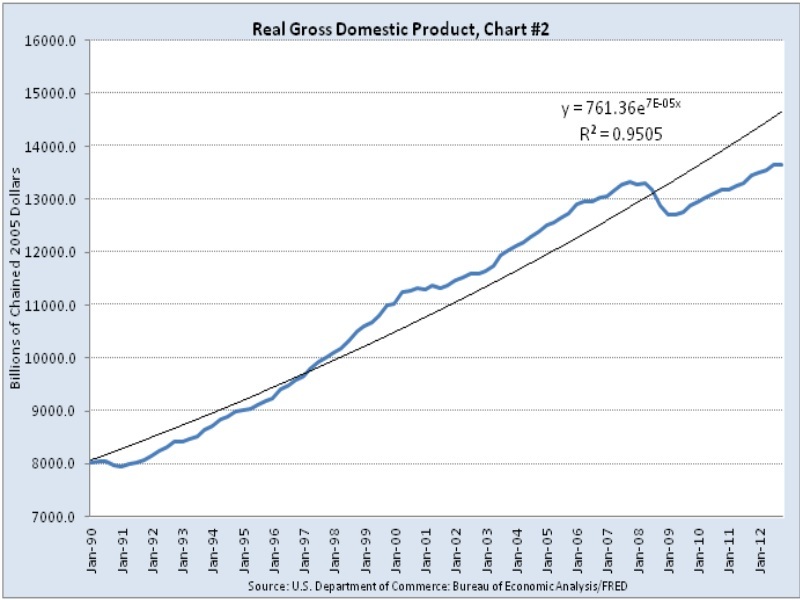 Even worse is the flattening of real GDP in the last quarter of 2012. Although that data will likely be revised upwards the prospect of a reversion to the trendline seems bleak indeed without major changes in federal domestic policy. The likelihood of which is dim, at least for the next four years. By that time the US economy may be on another track but millions of Americans will be left behind forever. For Chart #2 the starting point of 1990 was based on the fact that it is more contemporary data; it starts around the end of the 89-90 recessionary period; and the GDP chart shows it is relatively flat suggesting a good starting point. Even thought the “R2” data shows a diminution from 99% to 95% that is still a fairly strong representation. For reference the starting point of Chart #1 is that it is the earliest available data.